Clarksville, TN – Austin Peay State University (APSU) says that for William Cody, the Cold War was actually ice-cold. After joining the U.S. Coast Guard in 1983, at the age of 25, he found himself aboard a polar-class icebreaker ship off the coast of Antarctica. To keep warm, the crew drank authentic Russian vodka with bits of coal dust floating in it (they’d traded with Soviet sailors they met at the bottom of the world). William Cody, a history major and Coast Guard veteran, takes classes in Austin Peay State University’s Harned Hall. In 1987, when Cody, a Nashville native, left the Coast Guard, he decided to go to school down the road at Austin Peay State University. Within a year, the then-29-year-old had dropped out. Thirty years later, in the spring of 2017, Cody decided to give Austin Peay State University another shot. Today, the 57-year-old history major feels like he’s attending a completely different school, drinking coffee most mornings in the APSU Military Student Center (MSC) and visiting the APSU Office of Disability Services for different resources. For students like Cody, the University offers the MSC, a student veterans organization, Veterans Affairs counselors and several other military and veteran services. 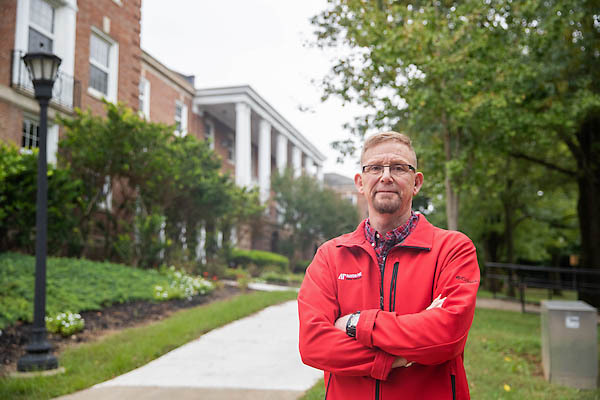 Austin Peay’s dedication to this population is part of the reason why it’s the state’s largest provider of higher education to military-affiliated students, with at least 2,329 enrolled students having a military connection in the fall of 2017. But for Cody, there was still something missing. One morning, while drinking coffee at the MSC, he noticed military crests hanging on the wall for four branches – the U.S. Army, the Navy, the Air Force and the Marines. What about the Coast Guard? He donated the Coast Guard crest to the MSC, and it now hangs on the wall with the other branches of the military.